1. 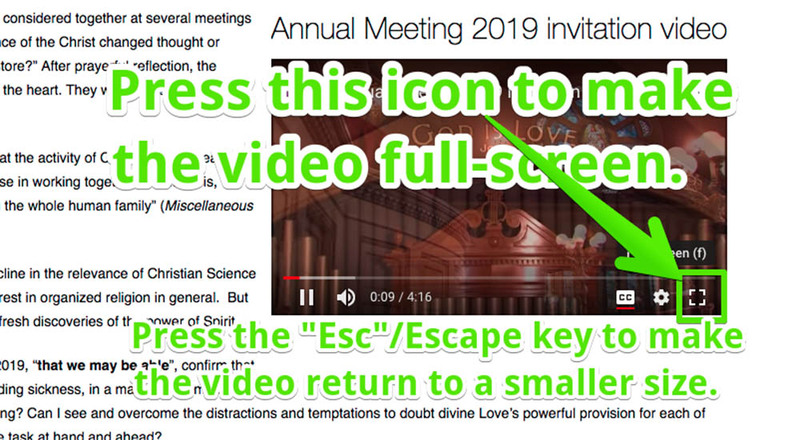 Test your computer or device for basic audio and video playback by clicking on the Annual Meeting replay. 2. Test with a live streaming audio webcast by listening to a live audio cast of the Sunday Service or of the Wednesday online testimony meeting. 3. Test with a live streaming video webcast using a third party site such as http://www.youtube.com/live. Audio and video webcasts begin streaming approximately 15-30 minutes ahead of the scheduled start time. If you aren't hearing or seeing anything, please check the volume or refresh the webpage. Using the latest Android operating system will provide the best results. The minimum bandwidth for audio playback is 48kbps. The minimum bandwidth for video playback is 350kbps. ChristianScience.com's primary video platform is YouTube. For specific YouTube help, please visit their help page. Full-screen mode is enabled by clicking on the double arrow icon on the video player's control bar. To exit full-screen mode, press the Esc key. Live streams are delivered to the viewer as the event is happening. Generally, seeking (rewind or fast-forward) is not available during a live webcast. If you join the webcast 10 minutes after the scheduled air time, then you are viewing 10 minutes into the event. If you pause the player, and play again 5 minutes later, then you have missed 5 minutes of the event. On-Demand (Replay) streams are often made available after some Live events have concluded. The stream will continue where you left off after pausing. Just like the Live webcast, you will need sufficient bandwidth to view the webcast. Download files may be available after some Live events. Just like on-demand streams, full player functionality is available. Bandwidth will not affect viewing experience, however it will affect download time. Your internet speed will determine how long it takes to download a file. Downloaded files may be played back locally on the viewer's computer with a pre-installed Player (Quicktime, Windows Media Player, etc.) or on a mobile media player. Please consult a computer expert if you need assistance with this. When available, you may download audio and video files to your computer. From Windows, Right-click on the download link and choose the menu option to save the file. From a Mac, CTRL+click on the download link and choose the menu option to save the file. Be sure that the system requirements are met for your browser. Check that bandwidth requirements are met and verified (see above). You can use fast.com to gauge your average bandwidth available. When available, if the stream is not playing back smoothly, try a lower quality stream. If you are not hearing any audio check the volume and mute settings of your computer, as well as the volume and mute settings of the player. Also, consider restarting your device. If your device or computer wasn't restarted recently, doing so, even on a regular basis can help make your computer run smoothly. If you need further help with webcasts, please email info@christianscience.com. If you need further help with the Annual Meeting webcast, please email AnnualMeeting@christianscience.com. Allow ample time (at least 48 hours) before Annual Meeting to troubleshoot your issue. Technical assistance may be limited on Annual Meeting day. If you need further assistance with your computer, please consult a computer expert.